Chinese almond cookies also known as Almond cakes or Almond crisp is a popular cookie that is made around the Chinese New Year to distribute to friends and family. 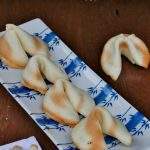 This Almond cookie is one of the simplest cookie that I have made and it is considered a sign of good luck. This month, I am beginning my Mega Marathon with my Blogging Marathon friends, themed A-Z Baking Around the World. We are going to be baking recipes from all around the world. The recipes have to be in the alphabetical order and one country cannot be repeated more that twice. I wanted to begin the journey with a sweet note and what else could be much more apt than the this Chinese Good Luck Almond Cookies. This is my recipe under the alphabet A from the country China. 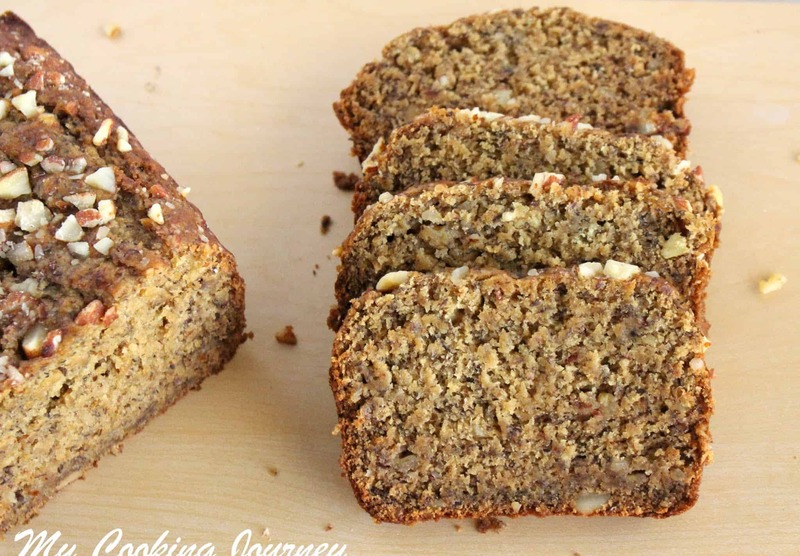 Do check back every day to see what is baking at My Cooking Journey! 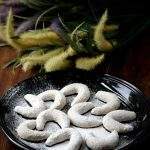 These Almond cookies were adapted from the Chinese Walnut cookies that was made during the 16th century for the royals. Eventually the cookie was started being adapted by commoners and they started using almonds instead of walnuts for other flavor profile. This Chinese Almond Cookie became so popular that there is a National Chinese Almond Cookie Day celebrated on April 9th in the United States. 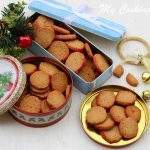 When researching about the cookies online, I found several version with butter, lard and oil. I have used butter a lot for most of the cookies I have baked and hence wanted to try it with oil to make it a vegan version. 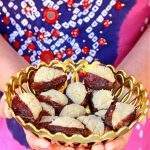 This almond cookie is very simple to make and it just needs a few basic ingredients. There are many recipes online with just all purpose flour and almond flavoring to make the almond cookies, but I did not just want to flavor my cookie with almond essence. I wanted the actual flavor of the almond and hence started looking for something with almond flour in it. I have used almond meal in the recipe, but you could very well use the almond flour instead. If using the almond flour, the cookies will be lighter in color and more white than the ones that I have made. 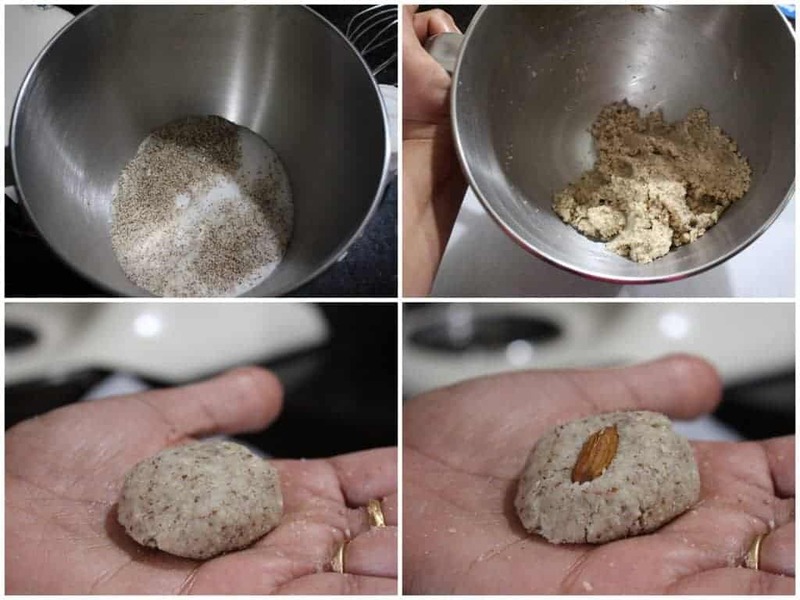 Almond meal is the same as almond flour except it is made with whole almonds (skin and all) whereas the almond flour is made with skinned almonds. I buy my almond meal in bulk from my local Sprouts store, but we can very well make it at home. I was a little concerned about how the flavor would be as I was using all oil in the almond cookies, but there is no trace of smell or flavor of the oil. It is very important to use neutral oil so that we don’t have the oil flavor in the cookies. I used vegetable oil for the recipe. The cookies had egg yolk wash on top of it. Since I was going all vegan, I chose to use almond milk wash on the cookies. If you are not making it vegan, but still want to make it egg less, heavy cream would be a great option. Preheat the oven to 350 F. Line a cookie sheet with parchment and keep it aside. I used store bought almond meal and hence did not have to process the almonds. If making it on your own, prepare the almond flour or almond meal and measure out 1/2 cup. In the jar of the food processor, combine the flour, almond meal, sugar, baking powder and baking soda. Run the processor a couple of times to combine the ingredients and slowly add the oil. Pulse the processor a few times until the mixture comes together as a loose dough. When held together in the palm, it should form a ball. If the dough is too dry, add a teaspoon more of oil and continue doing this until it comes together. I needed about 2 more teaspoons of oil to bring the dough together. Roll the dough into small balls and slightly flatten them. 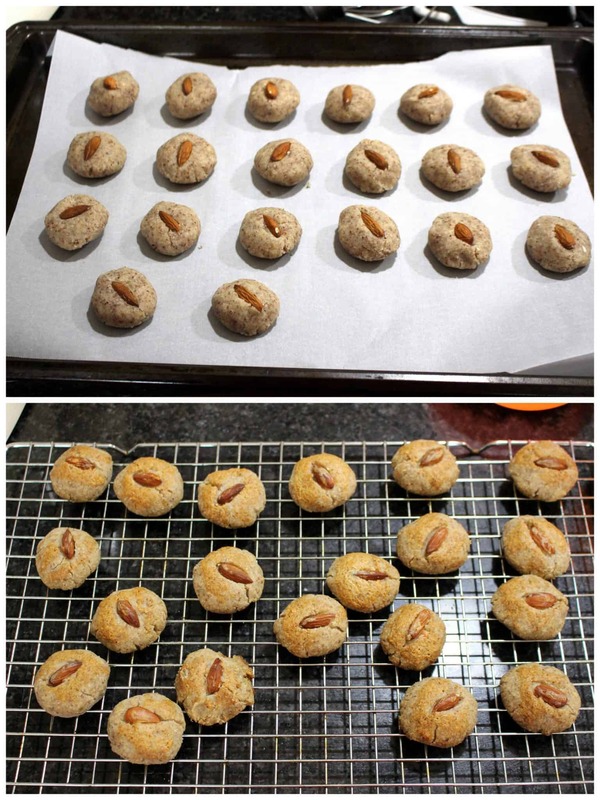 Press a whole almond or sliced almond in each cookie and place them in a parchment lined baking sheet. Brush the top of the cookies with almond milk liberally and bake them for about 15 to 20 minutes or until the top of the cookies have turned light brown. Carefully remove the cookies on a cooling rack and let it cool completely. If you like the recipe, do not forget to share it on Pinterest! Beautiful start sandhya. I had bookmarked these cookies too. Yet to bake them. These look super inviting.Love the fact that almond meal and just not the essence is used. Looking forward for the rest of the bakes!!! 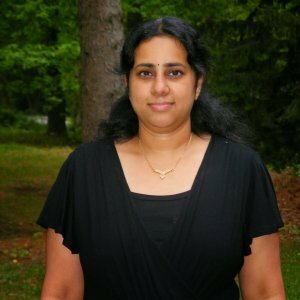 Thanks veena! I also liked it much better with the almond flour and not just the almond flavoring. You will like these cookies if you like almond flour. 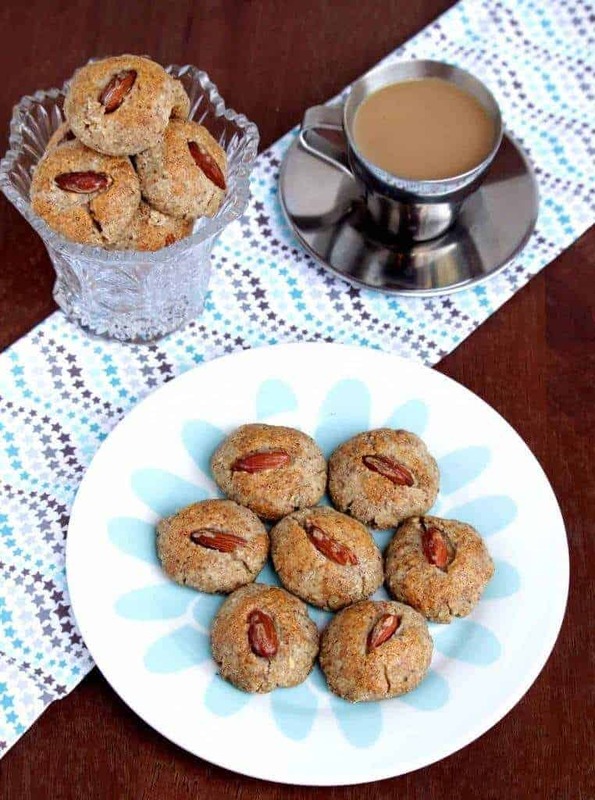 Yummy cookies with the goodness of almonds!! I absolutely love almond in anything. These almond cookies are a great way to start out your marathon! Can’t wait to see what else you come up with. Thanks Kylee! This is going to be an exciting month for sure. Hope and pray these cookies bring good luck to one and all!! Very tempting cookies and love that they are vegan. Are you going all vegan this month or what? Harini, thanks and no way I am going all vegan. I love almond cookies! They remind me of my mom – we used to have them with tea when I was a little girl. Such a fun afternoon treat! Childhood memories are the best and I am so glad these cookies brought back some of your memories! I have never tried these. I do like almonds…so I really think we would like them. They would be perfect for an afternoon latte for sure. They were an interesting cookie and it goes really well coffee! These cookies look so cute….I want to grab a few right now. Can’t wait to rest of your recipes for the month! Ironically we have Almond cookies too which we make for christmas in Austria and they are made the same way just that we don’t use almond milk but I think only almond flour and no maida. Such a nice way to start the mega BM Sandhya.Lovely looking cookies and nice to see almond meal used here. It gives a nice texture to the cookies. Wow, the cookies look melt in the mouth kinds, just trying to get the taste..and wow, they are amazing. Fantastic start! 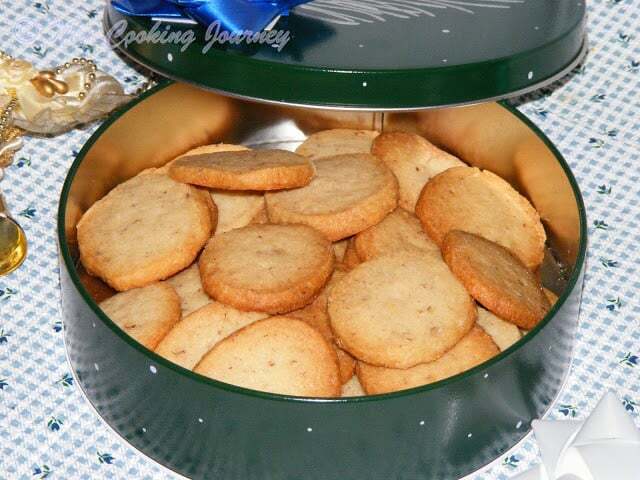 I love almond cookies – have not made some in ages. Need to make some again. These look amazing. Wow this recipe looks so easy! I need to try it out. We love cookies at my house – they’re perfect with the endless cups of tea and coffee that we consume! Almonds are one of my favorite nuts too … so it’s a win all around! Lovely start to the BM . 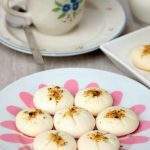 I have always wanted to make the Chinese almond cookies and now got the perfect recipe too. Looking forward to seeing your other recipes. This cookies sound really simple but so good. I love that you’re doing cookies from around the world. Sounds like a fun idea. 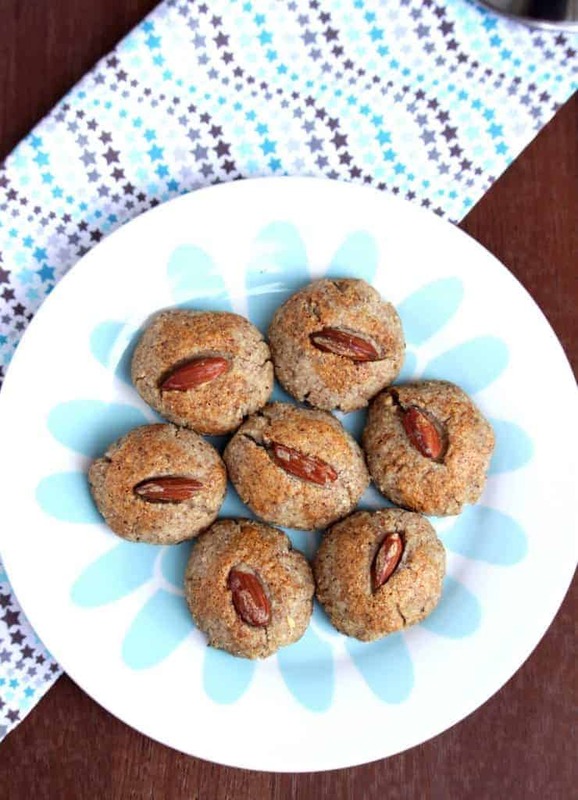 These almond cookies are not only delicious but also protein rich treats kids will love it. These Almond Cookies look so cute and that yellow shine on them is perfect. 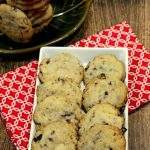 I love homemade cookies as they are so much more flavorful n you’ve control over what goes in. Really simple recipe and will try soon. 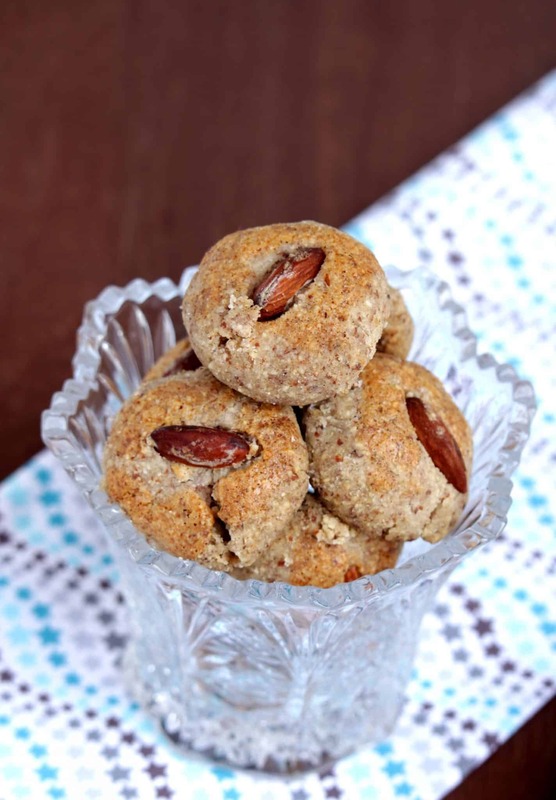 Such a lovely way to start the marathon Sandhya, these have been on my todo list as well…must bake these soon..I love how thick and yet so well baked your cookies look! I am a self-confessed almond addict as I will eat anything that almonds are added to! These cookies look delectable and would pair well with my cup of tea! 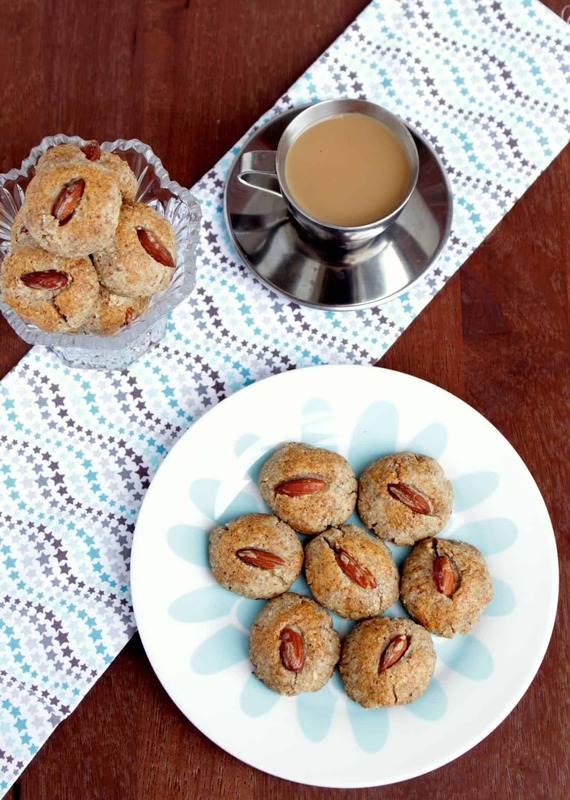 Almond cookies sound just delightful, especially with a lovely cup of tea. Almonds not only give a great textures, but also a nice flavour. I am sure they would disappear quickly if I make them for my family. Good luck with the marathon! I saw these on pinterest just yesterday and I’ve already pinned the recipe to my secret board so that I know right where to find it. 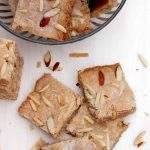 We love anything with almonds – can’t wait to make these! What a fun cookie! 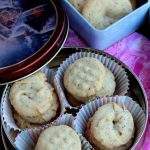 I have used almond flour for making macaroons but not regular cookies. I can’t wait to try them and I think they will be a good snack for me post workout. I usually just chomp on some nuts but this will be like dessert too! Can’t wait to see the rest of the alphabet! Perfect tea time snack.. Nicely done. Good to know how the walnut cookies changed to almond cookies. Great info. Lovely cookies Sandhya, wat a beautiful choice and a fabulous way to start this Mega marathon. 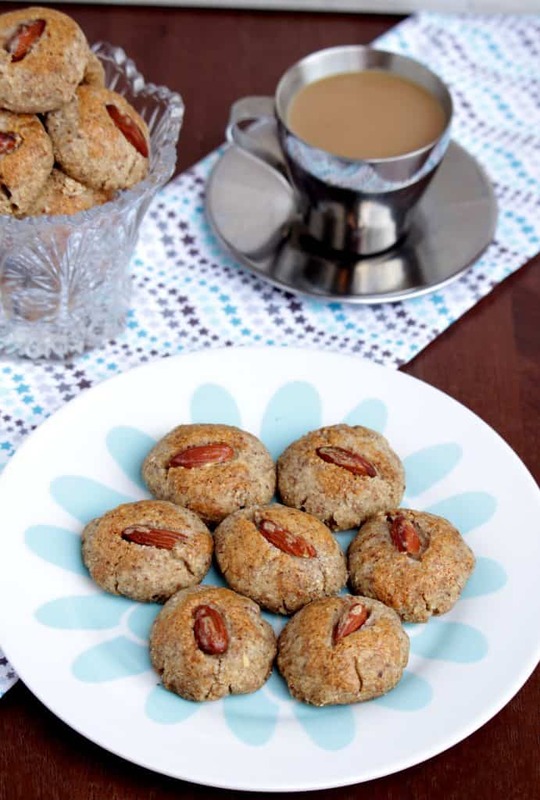 Vegan almond cookies looks absolutely incredible to munch without any fuss. Super start to the mega marathon. Lovely cookies. They look very crunchy.